Washi chopsticks are fine handcrafted Japanese chopsticks with handmade decorative washi paper laminated around the chopstick handles. This method of decorating chopstick handles with an application of a "design" or "decal" of sorts is perhaps the earliest predecessor to modern mass-produced heat stamp designs common on all inexpensive chopsticks produced in China today. Washi is the Japanese traditional craft of hand-making paper, dating back more than 1,000 years. Like manufacturing fine chopsticks, the making of washi has dwindled in the last hundred years with the advent of modern machinery and westernized utilitarian papers. Where there were over 100,000 families making washi in the 1800's, there are fewer than 350 remaining today. Although washi can be made as a plain paper, the fine craft of washi produces some of the most ornate and decorative papers, which is what's used on chopsticks. Washi is made primarily of three fibers - Kozo (mulberry), Mitsumata and Gampi. Other fibers such as hemp, abaca, horsehair, rayon, gold and silver foils are added for decorative effect. The plants are soaked, bark removed, and then pounded and stretched. The fiber is then mixed with fermented hibiscus root to form a fibrous paste that is then spread thin over bamboo screens and set to dry. The center of washi production is in Kyoto, Japan, close to Obama, Japan where 80% of all Japanese chopsticks are made. Thus the natural combination of washi and chopstick. Washi has been used in making shoji screens and even money, as well as for writing papers, wrapping paper, packaging, origami, and art prints. You can find a wonderful selection of washi paper wrapped Japanese fine crafted chopsticks at EverythingChopsticks.com. 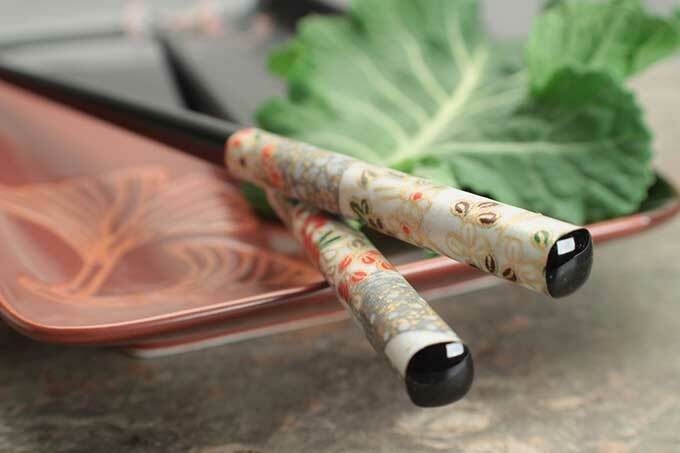 Browse the selection of decorative and functional washi chopsticks. They make excellent gifts for your favorite chopsticks lover (including yourself! ).